Hope is a losing proposition for investors to hold when it comes to the stock market. There is no greater example than with Sears Holding Corp. (Nasdaq: SHLD), the owner of the Sears and Kmart retail store chains. This company is going out of business, with Sears closing stores nationwide, and no amount of hope will change that view. As Money Morning Capital Wave Strategist Shah Gilani called it, Sears is a dead man walking. Gilani recommends that investors sell Sears stock and sell it hard. That means selling shares short. To do that, investors instruct their broker to borrow someone else's shares, sell them, and then buy them back after the price drops. Investors profit from the difference between the selling price and the buying price, as they would when buying stocks, but the process is just reversed. Sell now, buy later, make money. Short selling is not for everyone, and there is risk involved. Should shares move up in price, investors might have to buy them back at a higher price – and at a loss. And theoretically, there is unlimited risk should the stock suddenly turn into a retail powerhouse, causing its shares to soar. But realistically, the odds of that happening are miniscule with the way the company is bleeding cash and the general environment for brick-and-mortar retailers. With that said, a price pop to, say, $20 per share from Sears stock's current $10 would have its consequences. But according to our experts, that could be an opportunity to sell more stock at better prices. "It's a smart bet to sell short SHLD right here around $10.25," Gilani said on May 3. "If it goes to $11, short more. If it goes to $12, short more. If it goes to $13 and $14, short a lot more." "Another way to play the end of Sears Holding is to buy out-of-the money puts that expire in late 2017 – or, better yet, 2018 – to give yourself time in case the company pulls more rabbits out of its hat." 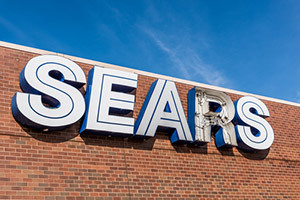 Money Morning Chief Investment Strategist Keith Fitz-Gerald wrote in a recent article that Sears is one of the three worst companies in the world and is one of his favorite stocks to short.